The best thing, and many will agree with me, about “Despicable Me” is minions. Those little yellow creatures will never stop amusing us. They are cute, adorable and funny. But they are also despicably bad. However, in the third part of this beloved animated film, we are introduced to new characters who might get a standalone film just to tell more about them: a goat and pigs. But let’s leave the most predictable part behind and learn what Kyle Balda, Pierre Coffin and Eric Guillon as a co-director have to offer to us in a new installment of DESPICABLE ME, stamped as part 3. Gru works as a special agent. He is married and enjoys his life as a father with his beautiful adopted children. Moreover, he seems to like the taste of being a good guy as he tries to improve it by building up his resume in the league of the best of the best. However, he is challenged by Baltazar Bart, a former TV star whose show got cancelled back in the 1980’s. Baltazar, who believed that the character he played on TV was his real personality, transforms himself into a villain taking that pedestal from Gru. After stealing the biggest diamond in the world, he promises to come up with the most disastrous idea to destroy the place he once called home – Hollywood. 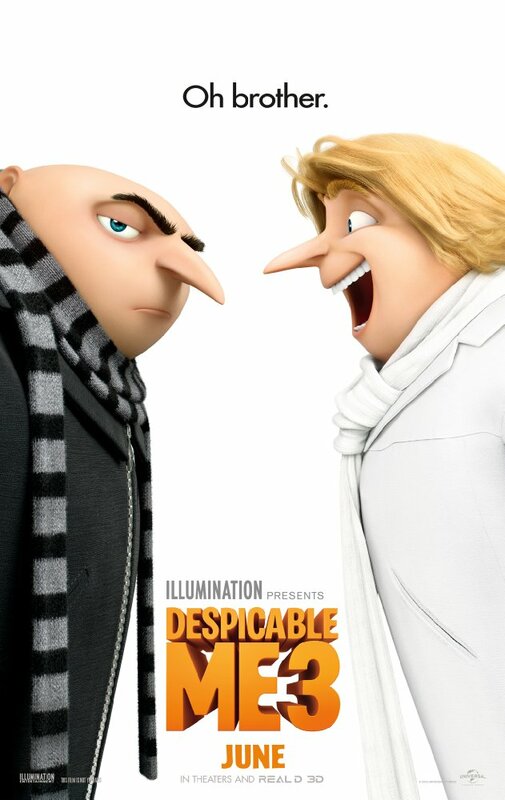 DESPICABLE ME 3 has excellent sequence of scenes that were animated precisely, and it will leave you speechless. The opening sequence where Baltazar Bart captures the boat, showcases the ‘moonwalk’, while you hear Michael Jackson’s “BAD” and two more scenes that I will talk about next are worth seeing as many times as you want – the prison scene and at the SING, where the same minions steal the entire movie by just doing what they do best – melt out hearts. Overall, the entire movie is an excellent continuation of DESPICABLE ME series, that one can wish it never stops hitting our theaters. In conclusion, the color and complexity of animation appeared to be pure perfection. Steve Carell and Kristen Wiig never disappoint when it comes to giving out their voices to animated characters. Having Julie Andrews as part of the cast was a delightful addition, but it could upset you as her appearance was brief but memorable. So don’t think much about reviews, positive or negative. Just see it to decide whether you want more of it, or you have had enough….